Cheesie and Georgie are back, and this time they're off to the greatest summer camp in Maine. As the oldest of the Little Guy campers, they'll get to make the campfires and choose the sports teams. It's sure to be their best summer yet! Then disaster strikes. Cheesie and Georgie are put in a cabin with the Big Guy campers, including Cheesie's archenemy, Kevin Welch. Now the youngest—and smallest—of the Big Guys, Cheesie has no choice but to use his brains to fight Kevin's brawn—he challenges the bully to a Cool Duel. The adventure that follows includes a toilet on a wall, a headless skateboarder, a garter snake mustache, and the scariest ghost story ever told. Will Cheesie survive to start middle school? With plenty of lists, drawings, and made-up words, Cheesie—with a little help from Steve Cotler—tells the story of the best worst summer ever. STEVE COTLER is a retired Little League catcher who thinks he is and always will be 11 years old. Visit Steve online at SteveCotler.com. Visit Cheesie at CheesieMack.com. Can Cheesie Mack keep his cool and survive a summer in the Big Guys’ cabin? At the close of Cheesie Mack Is Not a Genius or Anything (2011), soon-to-be–sixth-grader Ronald “Cheesie” Mack and his best friend Georgie secured the funds to go to summer camp on Bufflehead Lake in Maine. Days later, the duo climbs aboard a bus and head off to Camp Windward. Unfortunately Cheesie’s older sister, June, a.k.a. Goon, will be none too far away at Camp Leeward. When they arrive, their misfortune is compounded when their late registration results in both boys being stuck in a cabin with the older guys… including Kevin, the Goon’s boyfriend. When Kevin gives Cheesie a hard time once too often, Cheesie suggests a Cool Duel. Each night the boys in the cabin will vote on who did the coolest thing; in a week, the loser will have to embarrass himself in front of the whole camp by bowing to the winner. Can Cheesie prevail and still have fun at the camp he worked so hard to attend? 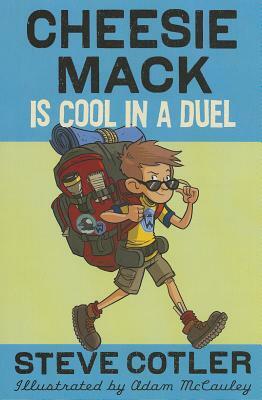 Cotler’s second in the funny and (sneakily) educational Cheesie Mack series is summer-camp fiction and interactive fiction perfected. Periodically throughout the text, Cheesie directs readers to his website to answer questions or offer opinions, many of which are commented on by Cheesie himself. These interactions are a lagniappe; readers without access to the Internet can enjoy the book thoroughly without it. McCauley’s black-and-white spot illustrations are just icing on the cake. The promise of volume three on the way will have readers cheering. Wind-WHOOP! Ronald “Cheesie” Mack is headed to Camp Windward with his best friend, Georgie. The trip begins with a disaster when Cheesie inadvertently hits his archenemy, Kevin, in the head with a spitball, and things continue downhill from there. At camp, because the director is Cheesie’s Granpa, the 11-year-old is asked on a daily basis by two girls to break the rules. While this is going on, he and Kevin decide to face off in a winner-take-all Cool Duel. As Cheesie tries to figure out just what the girls are up to, he also has to impress his roommates in Cabin H, who are older boys, that he is the coolest one at camp. The story has charm and appeal and is filled with words (and their definitions) that will expand readers’ vocabulary. Humorous illustrations appear throughout. Familiarity with Cheesie Mack Is Not a Genius or Anything (Random, 2011) does help readers understand past events, but this new installment can stand alone. With an uproariously funny and equally unexpected climax, the book should appeal to most anyone who picks it up. Cotler has created a website for Cheesie and welcomes submissions from readers. It's off to sleepaway summer camp for 11-year-old Ronald "Cheesie" Mack and various family members, friends, and enemies in this sequel to Cheesie Mack Is Not a Genius or Anything (2011). Similar in breaking the fourth wall and featuring lighthearted spot art, this outing relies even more on references to the character’s website: http://cheesiemack.com/ for opportunities to interact with Cheesie/Cotler and extend the book. While involved in a competition to be named coolest kid in his cabin of mostly older guys, Cheesie experiences lots of typical camp stuff (short sheets, scary stories, scarier girls) and has a great time, just like the reader will.